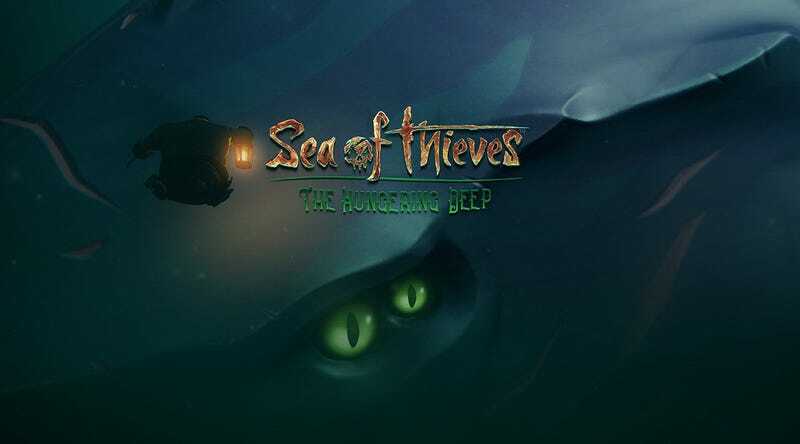 The Hungering Deep brings a lot of new features and Content™ that Sea of Thieves was missing at launch. Players now have a speaking trumpet (think of a pirate-themed megaphone) that lets them more easily start up parley with any ships they might run across. There are also several new customization options, ranging from tattoos for your pirate to flags for your ship. You’ll also see new NPCs who will fill you in on the new things and events Rare has promised to add at a steady pace. But the big draw is the new giant beastie that’s been added to the game. The leviathan isn’t just swimming around randomly. You have to complete an entire chain of events before you can summon it for a fight. The quest starts by talking to “Merry” Merrick on Shark Bait Cove and leads you on what is basically a scavenger hunt across the entire map. But most importantly, you need to have a group of at least five people to actually summon the beast so you can fight it. Due to the obtuse and cooperative nature of the quest, most players have called an unofficial armistice. Players will lead others to the next secret location on their scavenger hunt, help shuttle a sea shanty across the ocean, and of course team-up to fight an ancient sea monster. It’s like everybody in the game is helping each other solve and ARG. Compared to the normal social interactions, Sea of Thieves is pretty dang peaceful and bloodless. But this outbreak of goodwill and pirate brotherhood could all be temporary. Though the new features and monster are here to stay, The Hungering Deep questline is sadly temporary. Also the rewards for completing the quest is cosmetic, meaning there’s not really a reason to hunt the beast again. It could be Sea of Thieves will turn into a pirate free-for-all once again once most people have completed the quest. But in the meantime, I’m enjoying how quiet the seas have gotten. And who knows? Maybe all players needed to get along were megaphones and a giant fish to fight. Zachary D Long is available on the high seas of Xbox and Twitter as invadingduck.